Barcelona line-up: Valdés, Adriano, Bartra, Piqué, Montoya, Busquets, Song, Iniesta, Neymar, Lionel Messi, Pedro. Barcelona has dropped the lead in La Liga, after their 3rd loss of the season in Spain, this time in the city of San Sebastián, against Real Sociedad. The 3-1 final score even ended up being a bit flattering for the visitors, since it was Real Sociedad the side who created the most clear-cut chances to score. Neymar and Messi were both in the starting eleven, but Barça’s problems actually started arising at the back, which is where the team has been showing some worrying signs of lack of focus and determination. 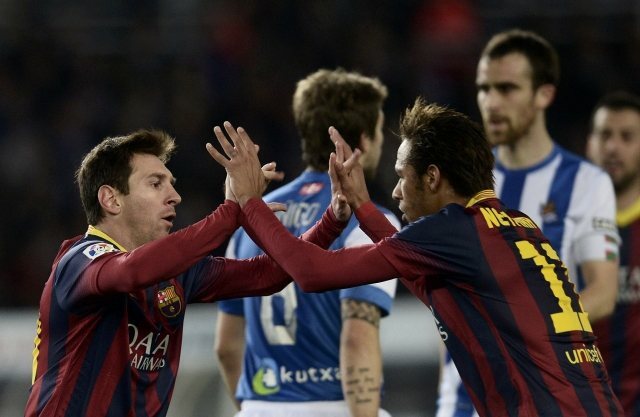 With this 3-1 loss in the Anoeta, Barça is now on a 5-game streak without winning at Real Sociedad‘s home ground. Tata Martino‘s men were surely more than aware that the game wasn’t going to be easy but it only took roughly 30 minutes for the hosts to score the opener. It all went down in the 32nd minute, when Sociedad took a corner kick on the right and Elustondo easily anticipated Song to head the ball towards Valdés goal. The cross ended up being deflected by Song himself and Valdés couldn’t avoid to get beaten from close range. The home side were in front, but there was still plenty of time left to be played. The reaction came right after and it would be Lionel Messi leading the charge. The Argentina international combined with Montoya and Busquets in the central corridor and Messi hammered the ball into the back of the net in a classy finish with his left foot. For a moment there it seemed as if Barcelona were going to start dictating their terms in the Anoeta, but soon we all realized it just wasn’t their night. The second-half brought us a Barcelona side even more passive than what we had seen in the first 45 minutes and Real Sociedad got to capitalize on that in the 52nd minute. Carlos Vela found a big breach behind Barça‘s backline, sent a low pass across the box into the far post and Antoine Griezmann seized his chance to put his side on the lead and score his 15th goal in this La Liga campaign. As if things couldn’t get any worse, Real Sociedad managed to extend the lead just 5 minutes later. This time it was Griezmann assisting a teammate, but what surprised us more was the lethargy shown by all Barcelona defenders when the cross was sent into the box. Zurutuza rushed from behind and had absolutely no marking or until he met the cross, allowing him to put the ball out of Valdés‘ reach with a slight touch. 3-1 and another capital mistake from Barcelona‘s defense. With Real Madrid win over Elche (3-0), Barça has now fallen 3 points behind the Merengues. However, the Blaugrana are still tied with Atletico in second place, since Diego Simeone‘s men have also slipped in the Reyno de Navarra against Osasuna, where they lost 3-0. Next weekend we’ll have an Atletico Madrid vs Real Madrid at the Vicente Calderón, so Barça will have an opportunity to capitalize on whoever drops points at the derby if they do win at home against Almeria, on Sunday night.